NASA selects OU to lead first-of-its-kind mission that could eventually benefit the energy and agriculture industries. Dr. Berrien Moore and Dr. Sean Crowell, both of the University of Oklahoma, are playing key roles in the GeoCARB Mission. In early December 2016, Dr. Berrien Moore of the University of Oklahoma received a phone call informing him that his and his team’s efforts over the last five years were being rewarded ­­­— to the tune of a record-breaking $166 million grant from NASA. The grant is to fund a mission to determine how carbon interacts with the land, the atmosphere and the ocean. Specifically, the Geostationary Carbon Cycle Observatory (“GeoCARB”) project will monitor plant health and vegetation stress throughout the Americas while examining the natural sources and processes that control carbon dioxide, carbon monoxide and methane in the atmosphere. The mission is truly ground-breaking as explained by Moore, Vice President, Weather & Climate Programs and Dean, College of Atmospheric & Geographic Sciences at OU. In roughly two and a half hours, the time it would take to cross the contiguous 48 states, you would have mapped the entire country. “So, every single day, we are going to see the concentrations of these gases in the atmosphere and then we can determine where it’s coming from, where it’s going to, how much is involved,” he explained. A secondary benefit of the mission will be the opportunity to learn more about solar induced fluorescence. Moore, a renowned international earth scientist, explains plants, besides requiring energy, also need to give off energy. As plants release energy, they yield a “glow” resulting from the process of photosynthesis in which plants create nutrients. This “glow” carries certain information regarding the stress levels and other functions of the vegetation. “If vegetation is suffering from a severe drought or disease, for example, we will be able to detect the problem prior to other indicators, such as a farmer inspecting his fields. With such an earlier warning, steps can be taken to lessen the potential damage,” Moore explained. 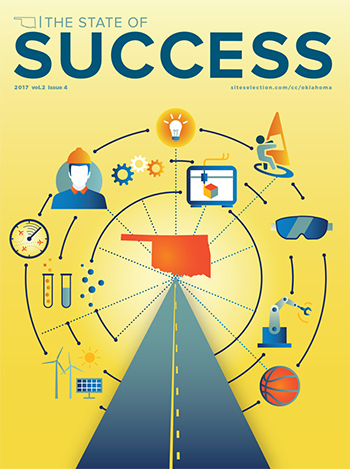 With the volumes of date to be yielded from the GeoCARB project, it is possible that two major industries in Oklahoma ­­­— energy and agriculture — could eventually benefit from the mission. “We’re going to be looking at the corn and wheat fields of the Great Plains, at the forests of New England and the apple orchards of Virginia every day,” Moore explained. The GeoCARB team will assemble an advanced payload that will be launched on a commercial communications satellite utilizing otherwise unused launch and spacecraft capacity, orbiting some 22,000 miles above the equator. The route to the record-breaking grant had been a long one as Moore first entertained visions of such a project as far back as 2010. “I first started thinking about this concept of putting an instrument on a stationary satellite that measures carbon dioxide, methane and carbon monoxide in January 2010,” he explained. As in many large government-agency projects, the application process is stringently detailed and the amount of paperwork is enormous. But several years of labor finally paid dividends with the awarding of the grant. While the exact date of the satellite launch has not been firmly set, Moore anticipates it could be late 2021. In the meantime, there is plenty of work yet to accomplish. Dr. Sean Crowell, Senior Research Scientist in the College of Atmospheric & Geographic Sciences at OU, who also serves as a key point man on the project, cites several intangible benefits derived from the grant. Moore also foresees the success of this project can be a springboard for future beneficial projects. Moore and Crowell also point out the mission will truly be a team effort with three NASA agencies and several other universities and businesses all collaborating. The NASA agencies include their Ames Research Center in Moffett Field, California; Goddard Space Flight Center of Greenbelt, Maryland, and the Jet Propulsion Laboratory of Pasadena, California. Other contributors include Lockheed Martin Advanced Technology Center of Palo Alto, California, SES Government Solutions of Reston, Virginia, and Colorado State University. Oklahoma astronauts have flown in each phase of the space program — a fact that no other state can claim. Moreover, Oklahoma scientists and engineers have helped design and send robotic probes to all the planets in the solar system. Numerous Oklahomans worked behind the scenes to get us to the moon and beyond. Many worked in Mission Control in Houston. Others worked at Cape Canaveral, Huntsville’s Marshal Space Flight Center, NASA Ames Research Center in San Jose, the Jet Propulsion Lab in Pasadena, NASA Headquarters in Washington, D.C. and NASA contractors throughout the country. Their space probes have visited both the inner planets and the giant outer planets. Mariner went to Venus and Mercury, the rovers and orbiters at Mars, Voyager and Galileo at Jupiter, Voyager and Cassini at Saturn, and Voyager at Uranus and Neptune. Currently, Juno is headed to Jupiter and New Horizons is on its way to Pluto. On all these probes, Oklahoma scientists and engineers were there designing the mission or working on the spacecraft and its experiments.